What a terrific home stand this is becoming for us fans. Big crowds. Interesting baseball. And a bunch of wins. Plus we have 4 more games to go. Life is good! Very pleased to see our favorite 2015 Bull, Alexi Casilla, back in the game after some time on the disabled list. Slightly annoyed that WDBB is the only place that recognizes that he’s the best hitter on the team. But maybe they’ll come around. Ryan Brett DH’d and led off with a home run his first at bat. Things were quiet until the 5th when Richie Shaffer, whose bat had been quiet since his fabulous first game with the Bulls, poked one over the Blue Monster. Unfortunately, a Shaffer error and a single took starter Scott Diamond out of the game. An unimpressive José Dominguez gave up a single and then walked in a run, bringing up some bad memories of all the runs the Chiefs had given the Bulls on Friday night. He got out of the inning, however, with a strikeout and a popup, leaving the bases loaded. The Rays/Bulls are certainly being cautious with Mr. Dominguez. Since coming off the DL he’s only had 5 appearances, none of them particularly successful. Jordan Norberto came on for the 7th and it got a bit ugly after two outs. Two singles and Jared Sandberg was quick with the hook, giving the ball to the spectacular young Jhan Mariñez. But Mariñez’ last outing was a one-out save on May 24th. It took him two batters to shake the rust off. First he hit a batter to load the bases, then he walked in the Chief’s second run. He got a ground out and then struck out the side in the 8th. But the game was tied. It got very interesting in the 8th. Alexi Casilla grounded out. Ryan Brett singled off the pitcher’s glove and Taylor Motter singled to right. Mikie Mahtook struck out and Alan Dykstra came to bat. When Mahtook came to bat, broadcaster Patrick Kinas began a lengthy exposition on the positioning of Chief’s center fielder Darin Mastroianni, pointing out how shallow he was and that, especially after Mahtook’s K, it didn’t make any sense to play that shallow. Essentially, and I’m sure he has made all his colleagues in the booth aware of it, he called the shot for Dykstra. 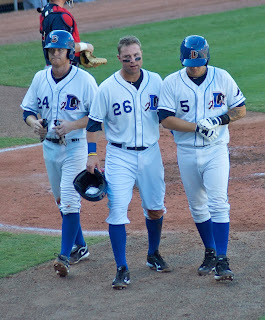 Dykstra put the 5th pitch he saw over Mastroianni’s head, both runners scored, and the Bulls were up 4-2. Ronald Belisario, in the grand tradition of Bulls’ closers, gave us some thrills in the 9th. He gave up two singles before Alexi Casilla started one double play, then made a very pretty grab and throw for the third out. It was his 12th save, which ranks him #2 in the International League. About that photo up top. Joe Dillon was one of my favorite Durham Bulls back in 2009 and 2010. What I admired about him in those years was how hard he worked and how much he seemed to love the game. What I like about that photo is how looks to me so much like three guys on their way home from work. The photo says to me, “We’re baseball players, this is what we do.” You can see him tonight, probably out at third base when the Chiefs are at bat. He’s their hitting coach. Nice to see him back at the DBAP. When Alexi Casilla came off the DL somebody had to go. After 4 games with the Bulls, Juniel Querecuto went back to the Charlotte Stone Crabs. Tampa Bay Rays infielder Tim Beckham tweaked a hamstring in last night's game in Baltimore. If serious, we can expect ripple effects down here.